Russian Video: Maxim Troshin – Russian Robertino Loretti! For many years in this world. And didn’t know any joy. Fly away to those lands. 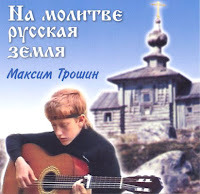 This entry was posted in Maxim Troshin, Musical Video on August 21, 2009 by admin. I discovered this song by watching the russian tv series "Gromovy". both, the series as the song are fantastic. As a 37year old man I´ve never cried so many tears by listing music….